Ingrid Classic Cane and Crutch Tip Large is extremely durable and provides for an excellent grip both indoors and outdoors. Extremely durable and provides for an excellent grip both indoors and outdoors. Tip does not wear as quickly as a conventional cane tip. Convex bottom enhances both walking comfort and durability. The Ingrid Classic Cane/Crutch Tip - Large is extremely durable and provides for an excellent grip both indoors and outdoors. 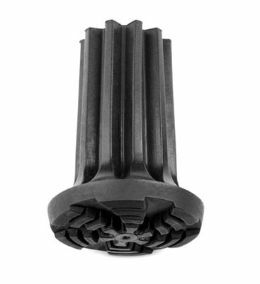 This large size tip is manufactured in Sweden and made of high quality polyurethane. Safety is enhanced because the tread pattern at the bottom of the tip does not wear as quickly as a conventional tip. Inside the tip is a rust proof metal washer made of zinc plated steel which prevents the cane or crutch from wearing through the tip. The "tire track" treads at the point of contact provide an excellent grip on most surfaces. The convex bottom enhances both walking comfort and durability. This cane tip has a patented elastic neck which adjusts to the dimension of the cane or crutch shaft, making it easy for the user to replace tips as needed. The large size tip fits very thick canes or crutches with diameter 13/16 - 1 1/16 inch (21 - 27mm). Fits: Canes and crutches with common dimensions of 13/16 - 1 1/16 inch diameter (21 - 27mm). Good for in-house or on sidewalks. Not so good on rocky terrain. 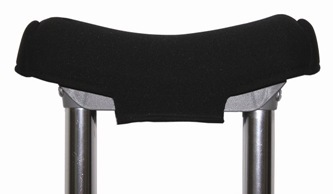 Grips need stronger sides so they don''t bend and slip off on uneven ground or on stairs when crutches are spread wide. Since I use crutches mostly outside, this is a bit of a problem. Item description is for cane or crutch tip so I bought it for my crutches. No good for crutches! Although the bottom is good, the neck is very thin and very flimsy. It bends easily and it slips out every time my crutches goes in an angle. The neck should be thicker. Very bad design for crutches, maybe would work for better on canes. I just used it for my table legs.